Bud has been around the farm since October, Minnie has been around for more than 10 years. She has seen everything, lost a leg, and put up with a lot of dogs. Bud is the first dog we’ve had who loves to chase cats, but not harm them. Flo has swiped him across the nose a few times and Minnie has put up with some impertinence from Bud, who is a hellion at times. Today, they seemed to become friends. 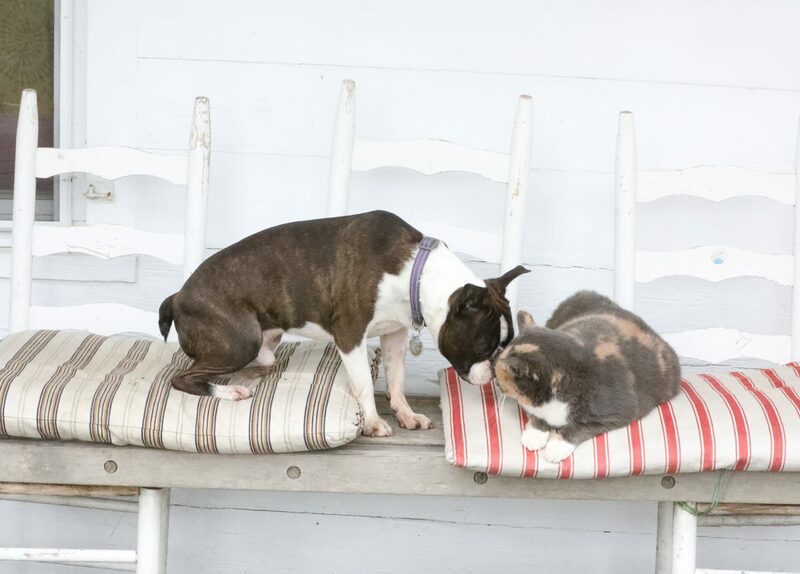 Bud jumped up on Minnie’s bench and they touched noses, a sign of animal affection. Minnie seemed quite at ease. Bud can cause trouble, but he is also a found of sweetness and affection.